b. Under all but the coldest arctic conditions. LSA or CLP are the lubricants to use on the weapon Either may be used at -10°F and above. However, do not use both on the same weapon at the same time. c. LAW is the lubricant to use during cold arctic conditions, +10° F and below. 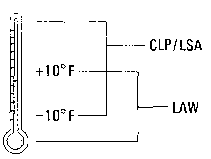 d. Any of the lubricants may be used from -10°F to +10°F. e. Do not mix lubricants on the same weapon. The weapon must be thoroughly cleaned during change from one lubricant to another. Dry Cleaning Solvent (SD) (item 15, app D) is recommended for cleaning during change from one lubricant to another. f. Rifle Bore Cleaner (RBC) (item 11, app D), may be used to remove carbon buildup in the bore and other portions of the weapon. 2-14. MAJOR COMPONENTS OF M16/16A1 RIFLE.